The Scottish Expenditure and Revenue Scotland (GERS) figures for 2015-16 were published this week. Despite some of the headlines that followed, they were great news for Scotland. Scotland’s onshore economy (as measured by the taxes we raise before including North Sea Oil income) grew in real terms by 3.6% in 2015-16 and is shown to have steadily grown by about 2.2% a year for the last 6 years. Our total public spending also actually grew by 1.0% in real terms last year, despite the much moaned about “Westminster austerity”. These aren’t the figures of an economy that’s suffering. The reason for the doom & gloom headlines is of course the £14.8bn (9.5% of GDP) “Scottish deficit” caused by the decline in oil revenues following the collapse of the world oil price. Four years ago Scotland’s oil revenues were £9,663 million. 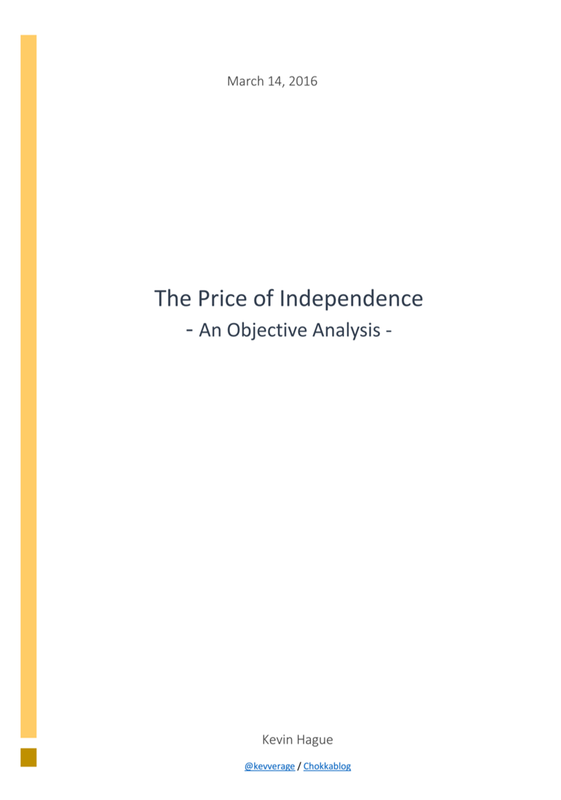 The independence White Paper assumed oil revenues in the range of £6,800 to £7,900 million for this year. The actual figure last year was just £60 million and - because of decommissioning costs and tax credits - it’s now forecast to be negative. This loss of oil income means that, despite the strong growth of our onshore economy, our total revenues grew by just 0.3% last year and are actually down by a whopping 10.6% in real terms since 2011-12 (the base year used for the Independence White Paper). In contrast, since 2011-12 Scottish public spending has declined by just 1.1% in real terms. This means that, while we now raise £400 less in taxes per person, Scots continue to receive £1,300 higher spending than the rest of the UK (as we have done for over a decade). That’s one of the benefits of UK-wide economic sharing - we’ve been able to maintain our higher public spending despite our dramatically reduced revenues. If you add our higher spending and lower tax generation, you can see we are now responsible for £1,700 per person more deficit than the average for the rest of the UK. Gross that figure up by our population and you get just over £9 billon, the infamous “black hole”. Even the SNP can't deny that this means we now receive an effective £9bn fiscal transfer from the rest of the UK, that pooling and sharing works massively in our favour because we share the UK’s deficit rather than being burdened with all of Scotland’s. So these figures are only bad news if you’re determined that independence has to be the answer, because then we’d have to fill that £9 billon gap some other way. To close the gap simply by spending less, we’d need to reduce all public spending by 13%. Nobody wants that. So if we’re to eliminate the black-hole that currently scuppers the case for independence, we have to find a way of growing our onshore economy faster than the rest of the UK. Unless we achieve that we’ll continue to be net beneficiaries of fiscal transfers. You don’t have to be a die-hard nationalist to want that to change. Obviously the main way to grow public revenue is by increasing the tax base though creating jobs and paying people more (who then go out and spend more). That means creating an environment within which businesses can thrive. The SNP appear to be pinning their hopes on achieving this by managing to keep Scotland in the EU. Unfortunately remaining in the EU now means leaving the UK, which means waving goodbye to that £9bn fiscal transfer. There’s also a logical problem when the reason being given is a fear that EU/UK trade will be hindered as a result of Brexit. This seems to ignore the simple fact that we export four times more to the rest of the UK than we do to the EU. If a UK/EU border hinders trade, being on the EU side of that would hurt us four times more than being on the UK side. There is another option: the SNP could stop talking up the prospects of yet another referendum and focus instead on building our economy within the UK. Investors don't like uncertainty so they’re put off by the threat of yet another referendum and the resultant uncertainty around our future currency and UK trade borders. But I'd argue the cost of continual threats of indyref2 is more than just the effect on big business and investor confidence - it runs much deeper than that. Scotland is a country where our political leaders invest their energies into trying to break our Union rather than working to build our economy. Our young people are bombarded with negative messages, provided with excuses not to succeed, hampered by reasons they can't instead of encouraged with reasons they can. It's Westminster's fault, it’s the UK's fault - we're cheated, hard done by, put upon - we can't succeed unless we break from the UK, or so the SNP argument goes. I can't think of a worse environment within which to try and encourage ambition, engender confidence, fuel entrepreneurial spirit and fill people with a sense of the possible - and yet that's surely what we need to do if we are to see our onshore economy out-grow the rest of the UK. A parting thought. Consider how much of our time, energy and money has been expended fighting against the UK and pursuing the dream of independence at any cost. Now imagine you could take just a fraction of that resource and invest it against positive, job creating, wealth building, economy boosting projects. Just think what we could achieve. I've been saying that for years that Scotland must innovate if it's to succeed. I like many others left Scotland to do better and I succeeded with that when I first left to work in England for several years like some 800,000 other Scots do currently. I then came back to build a business in Scotland which was very successful. However as the Internet and the Web came into being my old online business suffered enormously from being in Scotland as I was only in local call access to 0.5% of my membership. Had I moved the business to London I would still be running it but I didn't. I ended up building a web site which prospered but 96% of my visitors came from outside Scotland. I got zero help from Scotland and while I tried to persuade the big banks, tourism, education and Scottish Enterprise and local Councils to work with me they didn't as they lacked the vision. And so I moved to the US and then Canada and focused on the Scots Diaspora market which was very successful. I came across numerous Scots overseas who were doing very well indeed but most of them had the same story to tell... they'd left Scotland as they got no backing or encouragement. I then learned that many that were successful overseas came back to try and encourage Scottish exports as they saw great opportunities. Problem was they didn't find anyone that wanted to listen. I still offer to profile any Scottish business for free on my web site if they provide me with some decent information but over some 19 years I've perhaps had six companies that sent me information. Why is it that Scots are so shy of telling their story? The greatest fishing expert on the planet is David Thomson of Lossiemouth who has worked in the fishing industry in some 60 countries of the world for the UN. We have Dr James Wilkie, another Scot, who received the Cross of Honour in Gold for Services to the Republic of Austria in recognition of his work in compiling the Austrian Foreign Policy Yearbook for 16 years, and his previous 15 years as editor of the government’s foreign affairs magazine Austria Today, as well as numerous special assignments, many of them still highly confidential, on behalf of the Republic. Why aren't we talking to them? In the USA 10% of all millionaires are of Scots descent yet we don't seem to want to talk with them either. There are some 200 Highland Games in North America with millions attending but you'll not find Scottish tourism or business people there... a huge missed opportunity and I could go on. So while Scotland does need to grow its exports and inward investment we seem incapable of doing so and that to me is the big problem. As you've already noted 70% of our EU exports are to England alone. That really shows how inept most of our companies are when looking at exports and that is because they don't actually consider selling to England as exporting. The Commonwealth countries all speak the same language and are a much larger market that Europe with some 2.3 billion people and growing. With similar laws and culture that is a market we could exploit but again we don't. I blame the Scottish Government and Scottish Enterprise for this as again they show no vision as to what is possible. "There’s also a logical problem..."
Indeed. There are logical problems all over the place now. There is a logical problem when Nicola Sturgeon said that the Treasury's Brexit forecasts were 'overblown', then directly referenced the same Treasury forecasts in saying there would be a severe hit to the Scottish economy. There is a logical problem when the GERS statistics were repeatedly, without criticism, used throughout the Independence White Paper, but are now rubbished by certain nationalists. I would find this relentless doublethink exhausting, and I suspect it will eventually take its toll on nationalists. A huge deficit in Scotland means ultimately the UK deficit is bigger every year and we all as taxpayers have increased borrowing costs. So in effect, the UK's deficit this year is £75 billion instead of £60 billion because of Scotland's poor fiscal position. It means more of our taxes go towards paying off the debt and servicing the cost of borrowing and not towards investing more in public services. When it comes to the UK as a whole, the political parties all agree we must reduce the deficit every year and the amount of borrowing the UK has to do. But bizarrely there doesn't seem to be any realisation among politicians and commentators in Scotland that this higher spending comes at a price for the UK as a whole. I'd also like to challenge the rather lazy assumption that all public spending in Scotland is good and should never be reduced, as expressed by Kevin and many other commentators. Many assume that Scotland's higher than average public spending is because of the costs of delivering services over large under populated rural and island communities but while this might cost us more, I think it is a myth to suggest it is the sole reason we have such inflated public spending and one that must be challenged. Scotland's dire fiscal situation and inflated public spending is largely down to our generational problem of alcohol abuse, drug addiction, smoking-related illnesses, obesity and high prison population through our historical problem with violent crime. More people die from drug addiction every year in Scotland than are killed in road accidents or through homicides. Smoking related illnesses and obesity costs the NHS nearly £900 million every year to treat in Scotland. Finally our prison population is the highest in Europe per head of population and the cost of bringing criminals to justice per annum is around £700 million. Total up these costs and it comes to nearly £9 billion which is nearly a third of our annual fixed budget and accounts for over half of our annual deficit every year. To argue that public spending is always a good thing and we shouldn't look to reduce it is short sighted and naive. "A parting thought.Just how much of our time has been wasted (on)..."
Hi Kevin, I asked a question on you "6 key facts" post which you haven't answered. I assume this was an omission as you are generally very good at engaging with commenters. I'll ask it again in a slightly amended form. Now that oil revenue has all but disappeared, it seems reasonable to look at Scotland's economic position based on onshore revenue. In a sense this fits with the SNP's rather optimistic referendum claim that oil was a bonus. In your recent posts, you have shared a number of graphs which seem to show that if we compare onshore revenue with government expenditure, there has been a steady reduction in Scotland's deficit. If this trend continues, Scotland's deficit would, within a few years, reach a sustainable level. I had some problems with this blog. Its thrust seems to be advice to the SNP on how to improve Scotland's economic performance, so that Scottish independence can be embarked upon without pain when the rUK transfer payments are eliminated. But the solution doesn't bear much scrutiny, for at least two reasons. First, it is unlikely that Scotland's economy will improve sufficiently, in relative terms, to bridge the gap. But possibly more importantly, unless the GBP 9 million is progressively reduced as the hypothetical improvement in relative performance occurs, there will always be a 'cold turkey' effect when the 9 billion is removed. This would always be a major economic shock. However, I do agree that current SNP policies will make matters worse, not better, by undermining business confidence and imposing commercial barriers between Scotland and its major trading partner, rUK. Sturgeon appears implicitly to recognise the problem, because her current political instincts are clearly to try for a successful IndyRef2 before the financial consequences of independence are fully appreciated. It's quite shameless, of course, but I think she has worked out that it's her last chance. In many ways, the situation has similarities to Quebec secessionism. The Quebec government extracted considerable economic support from the Canadian federal government when secessionism was at its peak, much of which is ongoing. A bribe, in all but name. It probably suits most people. Quebec is wealthier than it would be under its unaided efforts, and Canada avoids break-up. One would expect a similar outcome in a rational Scotland, where the costs of independence are simply too high. There is no king hit that will replace oil and economic decline will beckon. But one cannot be certain that the Scottish independence movement will be defeated, because the SNP propaganda machine is both powerful and shameless. if you want to stop Sturgeon, now is undoubtedly the time to do it. And challenging the SNP's economic rubbish is surely the way to do it. More power to your elbow, Kevin. Thank you, Kevin, for this balanced view. I agree about the impact of Nicola's continuous gurning. It should be the rest of the UK which complains about Scotland's deficit; instead it is the SNP who keep whingeing about the "Westminster elite" and the "Tory toffs". This is so obviously chippy and stupid - but it is having the effect of putting off outsiders from investing in Scotland. Why should they invest in a high tax and high spend economy governed by inward looking Nationalists? Apols - i do this in my spare time! Yes, if we maintain tight spending control and continue onshore revenue growth we would of course no longer have a deficit after a decade or so (the underlying trend is one of improvement) ... but the *gap* to the rest of the UK wouldn't be closing unless we outgrow the rest of the UK ... so we would be "out of deficit" (or able to relax some of our spending constraints to benefit the poorer off in society) much much sooner if we remain in the UK. The challenge I guess will come when the UK starts increasing public spending faster - would Scotland be willing to keep spending frozen so as to close the gap rather than receive the money? Fair enough Kevin but asking those championing Indy to explain where and how and how much cuts will fall is a hypothetical question, unlikely to ever required to be answered, certainly not at present. Much more pressing is the here and now, with Scotland acting as a major drag on the UK's fiscal position. One of the burdens of responsibility that comes with winning the referendum was those opposed to independence have won the right to prove their version of the future is going to make Scotland prosper. When the SNP lose office the Tories, Labour or the Lib Dems will have to be ready to govern. I assume like me you don't want the SNP to govern forever and you also want the UK to start making surpluses at some point in the future. If this is the case Scotland needs to start contributing to reducing expenditure which will in turn increase the chances of the UK making surpluses to pay off the huge debt mountain. Drew - why do you exclude getting on with driving our inshore economy forward within the UK, using the powers we have and working together to make the UK as a whole stronger (instead of fighting against the Tes o the UK)? Equal opportunities, abortion law, speed limits and gaming machines, income tax, a proportion of VAT, Air Passenger Duty and the licensing of onshore oil and gas extraction, benefits for carers; the disabled, attendance and carers’ allowances; disability living allowances; personal independence payments; industrial injuries; severe disablement payments. Can you list which of these will be able to drive our inshore economy forward and explain why? Labour and the Lib Dems plans to raise income tax by 1p would generate an additional £500 million. Welcome revenue yet a long way off making a serious contribution to bridging the gap between Scotland's tax revenue and expenditure. If the new welfare powers are designed to mitigate the changes to the benefits being brought in by the UK Government, that's essentially a concession that the UK Government's welfare reform is damaging Scotland. Which of the existing or new powers we have will help offset the impact of tougher immigration laws by the UK Government and new restrictions on inward EU migration following Brexit? Scotland's population is likely to fall again and we will lose out on skilled workers from abroad leading to skills shortages and the entrepreneurship that migrants tend to bring, at the same time we have an ageing population with more complex health conditions. Unless I've missed something we have no power of any VAT - it's simply a revenue attribution. You appear to have slipped back into "we can't do anything unless we have all powers" (i.e unless we're independent) mode whi9ch kind of makes my point for me. Your attitude is part of the problem I describe - "we can't do anything if we can't do everything". Weird that when employment stats are good and economic performance is good the SNP claim that as their achievement - are you suggesting the party in power in Scotland can't materially influence our economic performance with the powers and levers we now have? If so I presume you attribute the strong growth in our onshore economy to Westminster policies, which is interesting. Notwithstanding my point above - as we saw consistently during indyref and as remains the case today, nobody has consistently suggested what it is exactly that Scotland would do differently - the same SNP MPs switch from "woo business with low taxes" to "break the capitalist system" from week to week. If this wasn't so serious to the lives of real people in need, I'd say it was a joke. I agree the SNP shouldn't claim credit when employment stats and economic performance are good but neither should any government. Governments by in large shouldn't be accountable for creating jobs, growth or prosperity. Entrepreneurs and businessmen like yourself create jobs and wealth. Governments should be responsible for ensuring a healthy, educated, skilled population is safe to go about their lives and provide the infrastructure is in place to enable people to get to and from work and leisure. Capital spending can create jobs and wealth but I'm not sure how much more The Scottish Government or local authorities can afford to do in this area at present. Where I live there are plenty of new schools and hospitals being built including the new Southern General and Victoria Infirmary in Glasgow by the local authorities and major projects like the M74 extension, M8 extension in Lanarkshire, M80 extension, New Forth road bridge, Borders railway reopening, Edinburgh Trams, Glasgow Subway upgrade, Edinburgh to Glasgow Rail Improvement Programme, the dualing of the A9 and Aberdeen bypass have all either been completed recently or are under construction. Personally I'd like to see a motorway connect Dundee, Aberdeen, Elgin, Inverness and Perth however I fear that is too costly at present. Governments are responsible for fiscal policy, controlling the levels of tax and spending. That's all I ask, is that Scotland is given enough power to control the level of tax and spending so it can improve it's own fiscal position. This will in turn help to reduce the UK's overall annual deficit and eventually reduce the amount of debt we all have to try and pay off. For my sins I'm a Lib Dem voter so I'm no friend of the SNP Government. Devolution has proved Scotland can do things differently with the right Government in charge and the Labour-Lib Dem administration lead the way in the UK with the smoking ban, free personal care for the elderly and the first major piece of land reform legislation for decades. So with a progressive government in Scotland, we can do great things if we are given enough power to achieve them. Next on the list has to be the power to raise duty on alcohol and tobacco and control over the misuse of drugs to tackle the £7 billion cost to Scotland's public services to dealing with alcohol and drug misuse. But I'd like you to explain how power over equal opportunities, abortion law, speed limits and gaming machines, income tax, Air Passenger Duty and the licensing of onshore oil and gas extraction, benefits for carers; the disabled, attendance and carers’ allowances; disability living allowances; personal independence payments; industrial injuries; severe disablement payments is going to reduce Scotland's deficit or make any improvement to Scotland's economy? Raising income tax or APD isn't going to make much of a dent in the £15 billion deficit unless you can tell me otherwise? Groundhog Day, Kevin. You keep asking for examples of how Scotland "would do things differently" (while still making the numbers add up and maintaining a decent standard of living for all) and every time come back the same evasions, denials, blame-shifting, wishful thinking and obfuscation. Anything but solid workable examples or even hypotheses, confirmation bias running riot. One day maybe there will be a cogent productive (and caring) response which goes beyond Union=Evil/Scotland=Good diagnosis based on blind prejudice and Scottish exceptionalism. But based on the comments on your blog from independence supporters so far, I wouldn't hold your breath. The bottom line is unless the Scottish Government has the power to reduce spending (or can work with the UK Government to reduce it on our behalf), there can be no major improvement in Scotland's fiscal position. Income tax would have to rise at least 20-30p in the pound from the current level to reduce the massive gap between our revenue and spending. Spreading this burden across the full range of revenue raising powers including fuel duty, corporation tax and alcohol and tobacco duty would be a much more effective way to try and meet our current expenditure commitments. Alcohol is abused in Scotland because it is cheap. There is a direct correlation between falling prices in the 1970s of cheap booze and rising levels of alcohol abuse. Only raising the price through alcohol duty will tackle this. MUP (if it ever gets approved in the courts) will not bring in the extra revenue required to fund alcohol treatment programmes funded by the government, it is the retailers that will profit. We cannot bring in more effective ways of reducing drug related deaths, like Portugal's highly effective decriminalisation and drug education policy or supervised injecting centres that are reducing drug deaths in cities across the globe, unless we have the power over the misuse of drugs act. We have no way of maintaining and increasing Scotland's population and bringing in skilled workers after Brexit, unless we have our own immigration controls. None of these new powers require independence, they just require a much smarter and more effective devolution settlement. You need to stop thinking in binary terms of thinking that every criticism of the current UK devolution settlement is an argument for independence. The interpretation is one thing, the reliance on the UK another. We "benefit" thanks to handouts and not standing on our own two feet. With the likelihood that the Barnett Formula that we "benefit" from is at least at risk then that "benefit" is questionable. When we get round to political aspects then we have a Tory government currently in power that is doing nothing to occupy the centre ground, and is adopting UKIP style policies despite Theresa May's platitudes otherwise on the day she accepted the keys to No 10. Add in a combination of events since, and let's pick 2003 as a reasonable starting point, just over a decade ago which have included a war the repercussions of which we still feel today, a failure on all sides to fully regulate the banking industry leading to a crash the repercussions of which we still feel today, the resulting policies of austerity that sees the UK nowhere near paying off it's dues and with a national debt of around £1.6tn, the demonisation of the poor, ill and working class...and so on. Our reasons for remaining within the failed club that is the UK from which we "successfully" pool and share is one that's rapidly becoming bereft of reason to remain. Perhaps more focus on GERS as a starting point, not the end result. Your statement (it's not an analysis IMO) is useful. As a means to bash the current Scottish Government, no doubt helpful to its critics. As a pointer for a future for an independent Scotland, it offers little beyond staying with the UK and maintaining the status quo. Too poor, too wee and it's beyond our ken supposedly. I differ. Thankfully, many others do as well. As a director myself, I see opportunity. You perhaps see something different which appears to be one of building an economy within the rapidly encroaching closing walls of the UK? Why limit ourselves to that alone? I'm astonished to see this limited rationale. Look over your shoulder for too long and eventually you'll walk into a lamppost. Perhaps you need to cast your eyes forth and your ambition further! Business for Scotland: Who Are They?